Park your car minutes from Glasgow airport and save some money. Make significant savings by booking off-airport parking at Glasgow, and you'll have a little bit extra to spend while you're away on holiday. Off-airport car parks tend to be a little bit further away from the airport, but they offer all of the benefits of parking at the airport; transfer buses to and from the terminal and top class security for your vehicle, all at a lower price. Off-site parking at Glasgow is already great value for money. Pre-book well in advance to guarantee your space and to save even more money. So guarantee your parking space today at Airparks Glasgow. 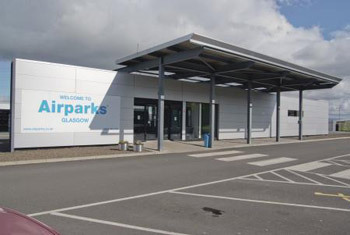 Airparks Glasgow is situated only a 10 minute transfer away from the airport. Even though the car park isn't on site it's not far at all via transfer bus. Transfers run 24 hours a day every 20 minutes. Airparks Glasgow is the fantastic option for off-site parking. Your vehicle is kept in a secure compound that has CCTV, 24-hours a day, high perimeter fence and floodlighting. This car park has been awarded Park Mark, a national security award in association with the police. Glasgow Airparks is inspected by police to check they are within standards and have modern security measures in place. If you land back late or just fancy getting on the road as soon as possible, why not upgrade your parking to a Airparks Glasgow Return Greet service. A chauffeur will meet you on your return back into the UK, ready and waiting for you with your vehicle. All you need to do is phone the driver once you have collected your luggage. No having to catch a transfer bus on your return necessary. What could be easier?